I'm using Windows XP. I tried windowed and streched mode didn't work. I'm using VM on full screen mode. Interestingly enough, I played RF at a LAN party recently, one of us couldn't get PF to load besides 640x480 resolution and the second time it wouldn't work at all. We tried the beta version too. Tried stretched, full screen, windowed, compatibility mode. All sorts. Odd thing was, one of the other guys had the same GFX card and drivers and DX version and he had no problems. Did they also get the enormous launch delay? It was something I ran into on 8.1. Didn't test much more. 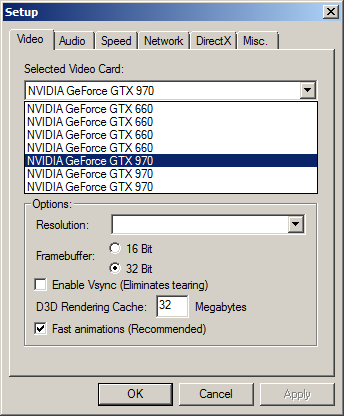 Can't use 8.1 because dwm vsyncs everything. One thing to check is the "selected adapter" in the stock RF launcher. If it's set to the wrong card or the wrong output on that card you might get CreateDevice failed. The setting was overlooked and not included in the PF launcher. Also it doesn't label anything so that's fun. Cheers for the suggestion. I can't recall if we checked it, but deffo worth a look when we have another session. I installed Windows Vista on Virtual Machine, and still no go. Pure Faction didn't work. Tried to run in full screen mode didn't work. I always get this error: Get Device Caps failed. Please make sure you have Directx 8 installed correctly. I really want to play RF! Try Crystal Faction... if there's not a download on this site we'll get one up but you can google it in the meantime. You won't have the pf autodownloader etc but cf's window mode stuff is much better than pf's, might work out for you. Anyone know where i can download Windows 7 for bootcamp? I need to get RF running. I don't have the Windows cd. I finally installed Windows 7 on my Mac book pro. I am still getting the direct x error. I got it working in bootcamp. It was the resolution.